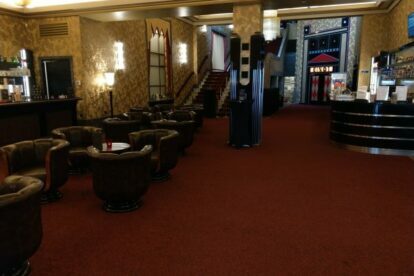 This cinema really attracts me with its super cool interior, which seems to be imported from the 1920s or has just survived since then. What you see is the entrance, but let me try to paint with words regarding the cinema itself. Imagine big, red armchairs so cozy you need to keep the tension not to fall asleep; a dark atmosphere with partly wooden walls, big and heavy curtains and golden elements everywhere. The big screen is hanging quite high which makes you lean back all the time. This is, to be honest, not helpful to stay awake, but still it’s a very comfortable way of watching films. The have a very diverse program, with blockbusters as well as special interest movies, opera and theater broadcasts and much more. In doing so, they are mostly specialized in the European film industry. Their program is as different as the snacks and drinks they serve. Of course you can have regular popcorn and coke, but they have alternatives as well. There is a sneak preview for just 6.50 every Monday, where you can discover new films in their original versions. The cinema is located very close to the train station so that you can easily continue your evening afterwards.